As the national debate on comprehensive immigration reform heats up, Georgia activists are fighting racist state-level policy. This article originally appeared at The Huffington Post and is reposted with the permission of the author. With comprehensive immigration reform afoot in Congress, and measures to grant undocumented immigrant students in-state tuition status spreading across the country, a galvanized movement in Georgia is ramping up its effort to end the state's extraordinary ban for undocumented immigrant students at the top five state colleges. The nation is watching: How much longer will Georgia's Board of Regents uphold a blatantly segregationist state law that has made the Peach State a national disgrace Consider this: Even Arizona, ground zero in the controversial "papers please" state immigration law, allows undocumented students to attend college—albeit with out-of-state tuition. 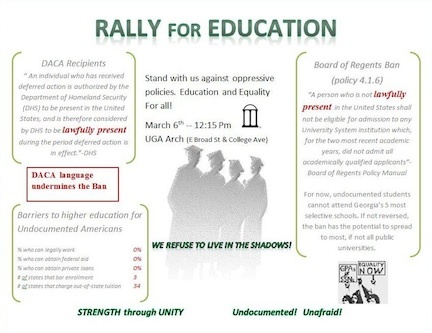 On March 6th, a large coalition of undocumented Georgia youth, students and a broad array of civil rights groups and supporters will host a march on the University of Georgia campus in Athens, under the banner that "Education is a Human Right," and remind the state of Regents Vice Chairman Felton Jenkins common sense declaration against the ban two years ago. "They worked hard and earned their spot. They could help make the state a better place." Photo courtesy of Project U. "We're rallying for justice, for education, to not to be discriminated against because of our immigration status," Miriam, a 21-year-old undocumented Georgia student noted. "Everyone deserves an education and the right to better themselves, to contribute to our state economy and to the nation. We're not taking anyone's spot; we earned our admission and that should be honored and not be conditional on someone's status. To better the United States, we need to educate the youth and barring higher education is not the solution." "All my academic life from K-12," added Aldo, a 17-year-old Georgia student, "I was told by the Georgia educational system that if I tried very hard in school, I would someday go to my local college. That gave me hope to overcome all the odds placed in front of me. That was the reason I got up every time I fell in all my academic attempts. But now that I am in my final year of high school I can see that I've been told nothing but lies and all the hard work I've done has been in vain." Athens is also home to Freedom University, the nationally acclaimed initiative by university professors and writers to provide college-level courses to banned students. We invest countless hours, resources, and money on providing our undocumented, immigrant students a K-12 public education. In The Education Notebook: The Cost of American Education, Dan Lips estimates the average cost of a K-12 education to be $100,000 per pupil. It is absurd to think that barring these or any students from a state institution is an intelligent financial decision. Not only are we losing their tuition dollars, we are losing all that we have invested. We invest in them, because they will go on to serve our state as productive members, but B.O.R. 4.1.6 brings that to a screeching halt when they turn 18 and matriculate. I have to ask you. How does this save money? How does this affect the proliferation and exchange of new ideas? How will this do anything but possibly lower state test scores and raise unemployment and crime rates? How does it make any kind of long term sense? To lock our undocumented, immigrant children out of college and out of their dreams doesn't ensure more seats for everybody else. It only serves to cheapen them. It only serves to water down the competition that our students need in order to help us become the strongest state possible. I am a Dreamer! A Dreamer who dreams to reach a higher education! 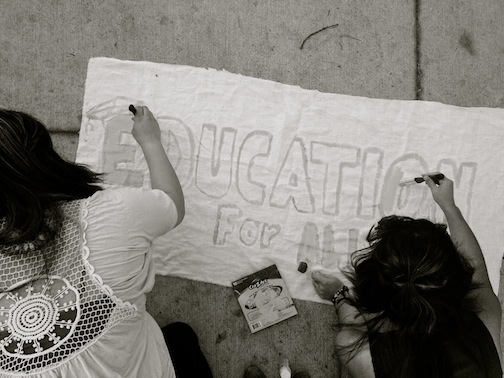 A Dreamer who will fight till the end for that education. I will not say I can't do it because I know I can. It will just take us a little bit longer to get there, but we will because no matter who we are, where we came from, what color our skin is, or what tongues we speak, education is a human right and we need to fight for it! But this Ban only makes it harder for me and my fellow Dreamers out there to reach that higher education. One thing is for sure, state of Georgia, no ban nor any anti-immigration law will stop us. That is why we need to fight till the end.